Pocket-sized laminated holy card measures 2" x 3 1/2" and features a picture of the grotto where Jesus was born. 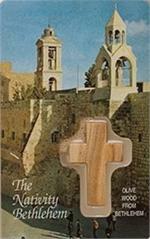 Embedded in the Holy Card is a Cross made out of wood from the Holy Land. On the reverse side is the "Cross in My Pocket" prayer.